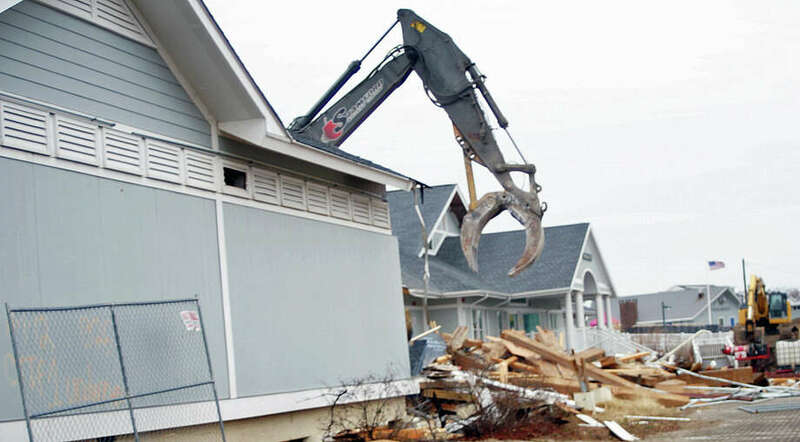 FAIRFIELD — Construction at Penfield Pavilion started in earnest this week, as demolition of the east wing of lockers at the beachfront structure began Monday morning. Construction equipment was moved onto the site the first week of March, and demolition of the wing is expected to be completed by the end of the month. The pavilion has been closed since October 2012, when it was damaged by Superstorm Sandy. The project to rebuild and reopen the pavilion is finally beginning after two years and 40 building committee meetings. The $7.4 million price tag is being financed primarily with 75 percent reimbursement of eligible costs from the Federal Emergency Management Agency, plus a $500,000 state grant, $1.75 million from insurance and $1.4 million in town money. After demolition of the east wing, the west wing will be raised, reinforced and then moved back into the parking lot. That work is expected to take place between April 1 and May 24. A new foundation, including driving timber piles for the structure, will take place from April 15 to May 10 for a new east wing and from June 8 to July 10 for the west wing.